Many biological transport networks employ adaptive strategies to respond to stimuli, damage, and other environmental changes. We model these adapting network architectures using a generic dynamical system on weighted graphs and find in simulation that these networks ultimately develop a hierarchical organization of the final weighted architecture accompanied by the formation of a system-spanning backbone. 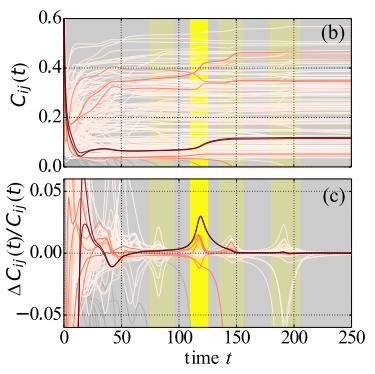 In addition, we find that the long term equilibration dynamics exhibit behavior reminiscent of glassy systems characterized by long periods of slow changes punctuated by bursts of reorganization events.